ICRI proudly announces its association with DIA (Drug Information Association) making learning easier for Clinical Research professionals. This association provides a direct opportunity to all its students for interacting with industry experts. DIA is world’s largest Clinical Research organisation interconnected to many leading organizations as well as professionals. DIA is an open forum that provides opportunities to discuss scientific and medical innovations. DIA keeps you updated with current healthcare products, latest advancements and technologies in the medical industry. Why be a DIA Member? 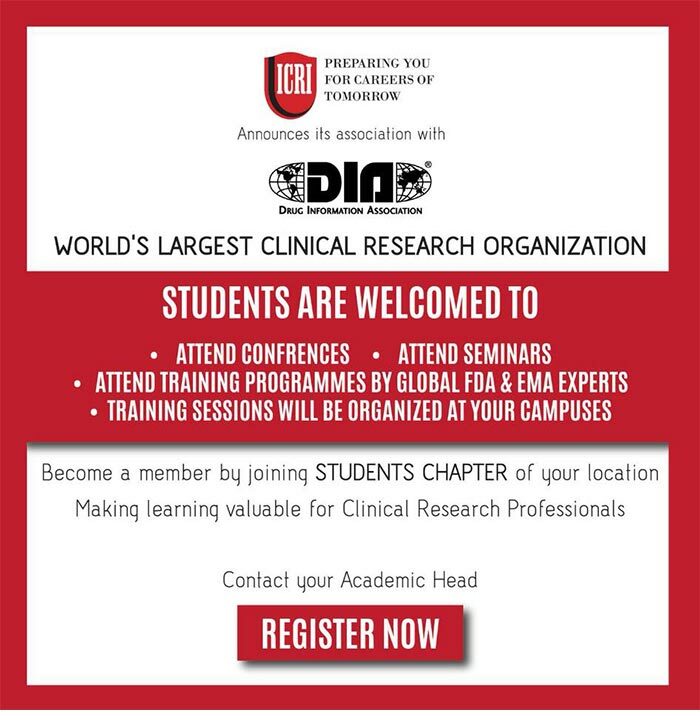 By joining DIA’s Students Chapter, here is your chance to have a direct association for seminars, conferences, industry fairs & training on leading trends of Drug Development. Students get trained on product development, regulatory science, and therapeutic innovations. Opportunity to get exposed to an open platform leading to interact with industry professionals. Enhance your skill set by participating in seminars, conferences, industry fairs and joining online communities.